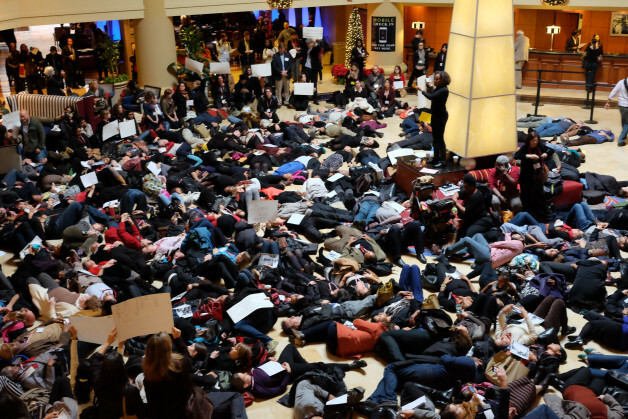 The killing of Michael Brown, violent practices in everyday policing, and policing of political protest compel us to return our scholarship to the tragedies of racist violence, racialization, and racial inequalities. Failures to charge the killers of Michael Brown and Eric Garner compel us to consider how the direct and structural violence of policing and justice systems are part of broader systems of racialized injustice. APLA’s programming committee wants to be part of facilitating a diverse slate of panels on the theme of Race and Justice for the upcoming meeting in Denver. We welcome collaborations with program editors across all the sections to develop and support panels across the Association. The theme of the 2015 AAA meetings, “Familiar Strange,” can serve as a thought-provoking catalyst for new discussions. Racial categories work to simultaneously familiarize and estrange people in social life — creating the illusion of familiarity and knowledge about others, while hierarchically differentiating and distancing groups of people from one another. This is only one example of how racialization operates. There are many possible approaches to exploring these issues, and we are happy to facilitate panels from contemporary and historical standpoints, within and beyond the US. The growing anthropological scholarship on policing is one area where panels might direct attention. Another area of interest is broader racial inequalities in the administration of justice, including mass incarceration in the US and the role of race in the “War on Terror.” Other areas for collaboration include: social movements for racial justice; race and restorative justice (eg, reparations); the construction of race in politics (from transnational to local levels); race, imperialism and postcolonialism; and the political economy of race. Our discipline and association have worked since the early twentieth century to overcome roots in scientific racism, and this history is another possible area for collaboration across subfields. This November, let us answer President Heller’s call to action by bringing our diverse insights into a coordinated conversation about the intersections of race and justice. If you are looking for a discussant or participants from outside your section, would like to circulate a call for papers through the APLA listserv and website, or have any other ideas regarding collaboration, please let us know (you can write Jeff Martin at jmart@illinois.edu). We also hope we might reach out to you with similar requests. It is our goal that this year’s meeting will see organized engagement with issues of race and justice that showcases the strength of dialogue across our Association’s diverse membership.